That composer Andrew Lloyd Webber's favorite tune is "Itsy Bitsy Teeny Weeny Yellow Polka Dot Bikini". In fact, if you listen closely to the title song from The Phantom of the Opera, you'll discover the melody is, in fact, a minor chord paraphrase of the 60s hit. Webber liked it so much he produced another version of the pop ditty that hit Number 1 on the UK charts in 1990. Walter M. "Matt" Jeffries died today. He was 82. A freelance aviation illustrator who drifted into the motion picture business, Jeffries designed the U.S.S. Enterprise for the original Star Trek series. Jeffries had flown in World War II, and his aviation background was the main reason the head of the art department at MGM assigned him to work on the pilot episode of the science fiction series. As luck would have it, the producer of the show- Gene Roddenberry- had also flown B17s during the war. The two began an association that would result in the creation of a ship design that's instantly recognizable everywhere in the world. Jeffries received only rudimentary guidance from Roddenberry, whose instructions were, simply: "no flames, no fins, no rockets. Make it look like it has power." In addition to the external shape of the fictional starship, Jeffries also devised the bridge of the Enterprise. Its circular layout has been copied by business and the military for various operations centers, but its construction was actually dictated by the demands of series television. Composed of movable pie-shaped wedges, the arrangement allowed sections of the bridge to be pulled out to permit room for cameras and other equipment. Unlike many art directors, whose contributions are mostly unrecognized outside the trade, Jeffries attained a sort of immortality. 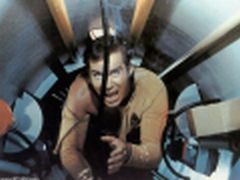 A crawlspace he designed for an episode of the original series was dubbed a "Jeffries Tube" by the cast and crew. The name stuck, and every Federation starship in every Star Trek television series, motion picture or novel has one of the eponymous passageways. Jeffries' fame as a starship designer is similar to the late DeForest Kelley's success as Dr. Leonard "Bones" McCoy. Kelley originally wanted to become a doctor, but couldn't afford medical school. He noted in a 1982 interview with Allan Asherman that "I'd wanted to be a physician and couldn't - and yet became the most well-known doctor in the galaxy." Similary, Jeffries wanted to design aircraft and couldn't - and yet will be remembered as the man who built the most well-known starship in history.